Setting: Many in the church were confused about the timing of Christ's return. Because of mounting persecution, they thought the day of the Lord must be imminent, and they interpreted Paul's first letter to say that the Second Coming would be at any moment. In light of this misunderstanding, many persisted in being idle and disorderly, with the excuse of waiting for Christ's return. 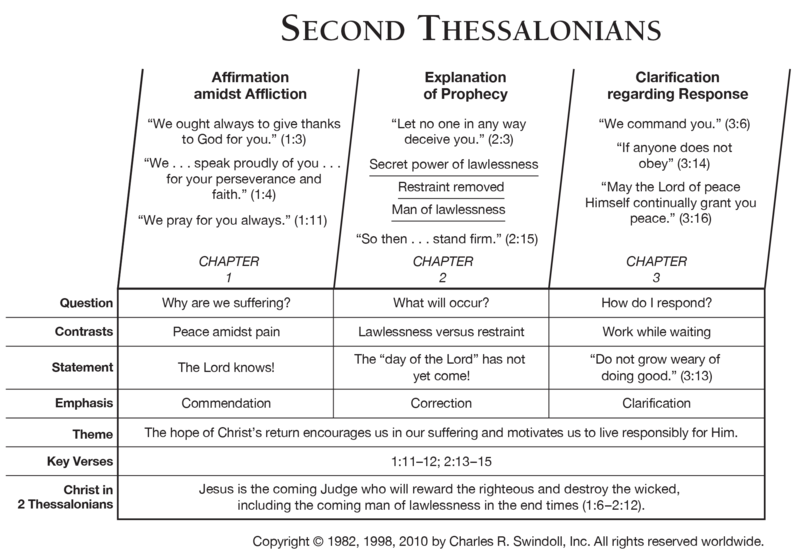 Special features: This is a follow-up-letter to 1 Thessalonians. In this letter, Paul indicates various events that must precede the second coming of Christ. New Geneva study Bible. 1997, c1995 (electronic ed.) (1 Tes 5.26). Nashville: Thomas Nelson. Paul wrote to encourage those who were facing persecution and to correct a misunderstanding about the timing of Christ's return. The teaching about the Lord's return promoted idleness in this young church. The imminent coming of Christ should never make us idle; we should be even more busy-living purely, using our time well, and working for his kingdom. We must work not only during easy times when it is convenient but also during difficult times. Christians must patiently watch for Christ's return and work for him while they wait.